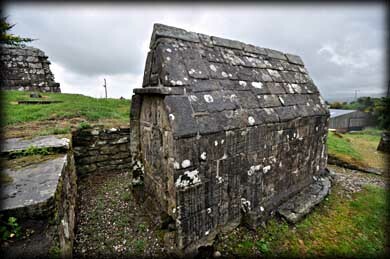 The old church at Banagher is traditionally believed to have been founded by a local saint, Muiredagh O'Heney. The oldest part of the church, the Nave, dates to the early 12th century. The fine west doorway has superb square moulding with inclining jambs. It is lintelled on the exterior but has an arch on the inside. 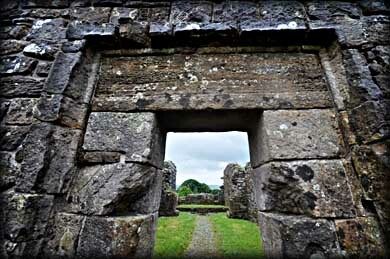 The exterior is similar to the romanesque doorway at Aghowle in Wicklow. There is a round-headed window in the south wall with moulding on the exterior. The interior is deeply-recessed. In the 13th century the east wall of the nave was broken through and a chancel was added. There is a nicely decorated capital with moulded pillars at the site, suggesting there may have been a chancel arch. Pictured above are the south window of the nave, the decorated capital and the superb moulding on the exterior of the chancel's south window. 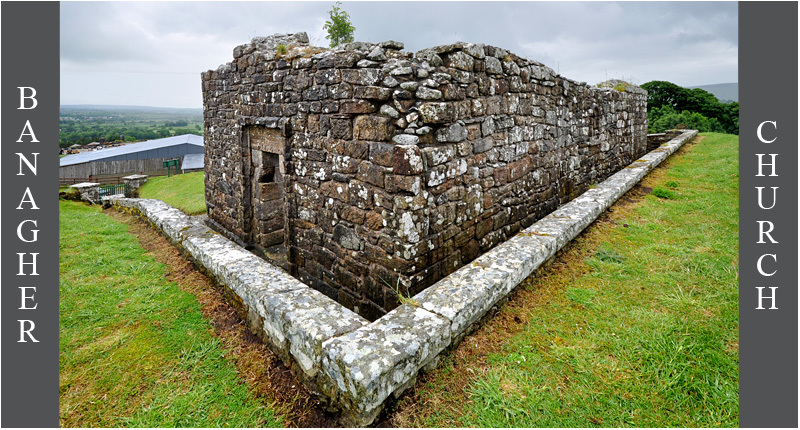 The first structure you see as you approach the church is a small rectangular building, pictured below left, traditionally known as the residence or abbey. It may have been a three storey building originally with the entrance on the second floor. It is believed that this is where the saint would appear to the people. 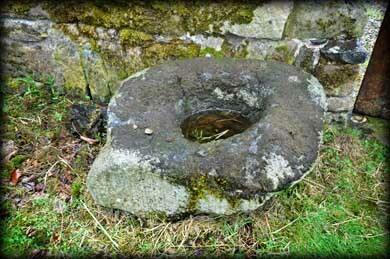 Situated outside the north wall of the building is a stone with a large single bullaun. The main reason for my trip to Banagher was to photograph the mortuary house. I have visited most of the various types of tomb shrines around the country but had never seen this distinctive type of shrine. 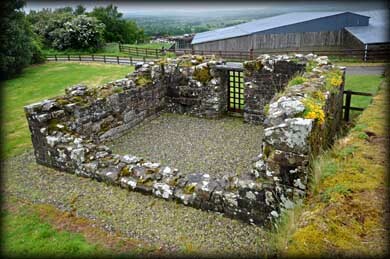 Mortuary houses are found only in the province of Ulster. 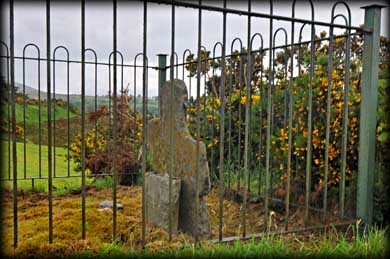 It is believed to house the relics of the founder, St Muiredagh O'Heney. The 3.25 metre-long structure has a steep gabled roof sitting on 1.06 metre-high walls. At the western end, pictured right, is a panel bearing a carving of an ecclesiastical figure, possibly the founder. 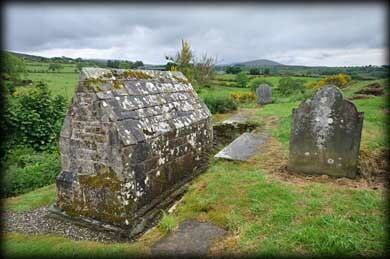 From here I traveled north to see the mortuary house at Bovevagh. Also present at Banagher are two boundary crosses. There were probably four crosses originally, marking out the area of consecrated ground belonging to the monastery. The rough cross pictured left stands on the top of the hill to the east of the church. To see the cross pictured below you have to go back out on to the Carnanbane Road turn right and walk further up the hill. The broken crude cross stands inside a small enclosure in the second field on your right. The head is now resting against the broken shaft. Situated: From Dungiven turn southwest onto New Street Signed (Maghermore Courtyard). Banagher Old Church is 2.2 miles down here on your right. Sign-posted. Discoverer Map 7: C 6750 0660. Last visit June 2013.